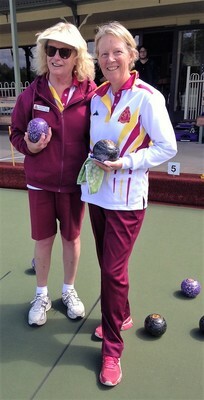 Runner-up Marg O''Brien and club champion Karen Rice. 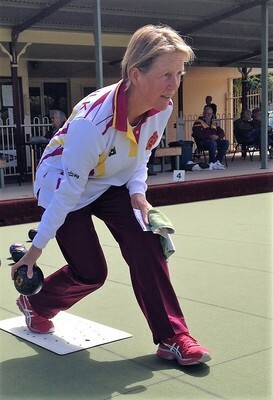 On Sunday 2 December, a good crowd watched the men’s and women’s club championship singles finals for Monbulk Bowling Club. The ladies’ event was between Karen Rice and Marg O’Brien and the men’s event was between Andrew Bell and Geoff Peterson. The knockout rounds in the preceding weeks were tightly contested. O’Brien was trying to reverse last year’s result where Rice came out the winner, and Rice was trying to go back-to-back. The game progressed at an even pace, with both women getting on the scoreboard early. Then Rice won a couple of multiples to put O’Brien under pressure. O’Brien responded with some out-of-the-box deliveries to stay within reach, but Rice broke away on the scoreboard and hung on to take the title 25 shots to 14. 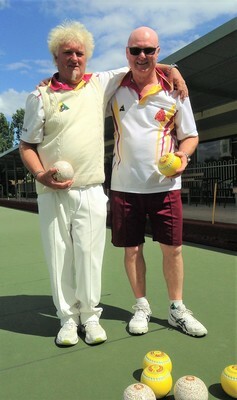 Petersen, in his first year of bowling, was taking on club coach Bell. Bell had been club champion five times and runner-up seven times. This time, both men put scores on the board early but Bell took control and left Peterson sitting on one shot for half the match. Peterson was bowling well, but Bell bowled better. On several occasions the umpire had to pull out the specialist measuring tools to decide between close bowls. Bell finished on 25 shots, with Peterson on eight. It was a high-standard match. In Monbulk’s midweek pennant, top-of-the-ladder Monbulk 1 played last-placed Lilydale at home. Bell’s team led all day and had a convincing win by 19 shots, 30 to 11. Eric Markham’s team had a close battle for most of the day but gained the upper hand after the lunch break to win by six shots, 20 to 14. Richard Cookson’s rink was up 20 shots to three on the 10th end. Then Lilydale mounted a strong comeback to win nine of the next 10 ends to get within two shots leading into the final end. Then Monbulk responded, picking up two shots to win the game 23 shots to 19. The overall result was that Monbulk won by 29 shots, 73 to 44. 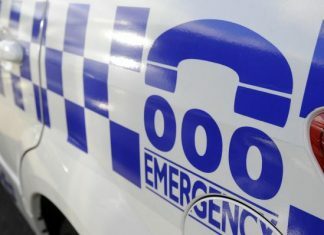 Monbulk 2 played away against Healesville. Everett Hargreaves’ rink were down, two shots to 22, at the break but came back out after lunch and convincingly won the back half. However, they had given their opponents too much of a start and lost by 14 shots, 15 to 29. Peter Francis’ rink was in front after the fifth end, but lost by 13 shots, 12 to 25. Eric Furby’s team was Monbulk’s star for the day, leading all day to win by 18 shots, 30 to 12. The overall result was a win to Healesville by nine shots, 66 to 57. Monbulk 3 played at home against Boronia. Peter Lee’s team was level at seven shots all at the break. Then they had a close struggle after lunch, briefly losing the lead on the 16th end but finishing strongly to win 18 shots to 14. Mike Harris’ rink was up 15 shots to four at the break with some good bowling from the skip. The opposition rallied, but the team managed to hang on to win 20 shots to 14. Don Barnetson’s rink had a confident win, 32 shots to 10, and this meant that the side had a convincing win by 32 shots, 70 to 38. On Saturday 1 December, Monbulk 1 played Vermont South at home in windy conditions. Monbulk’s opponents adapted better to the difficult conditions and established an early lead and were able to maintain this for the majority of the afternoon winning by 20 shots, 85 to 65. Bells’ rink fought hard but went down on the last end to lose by one shot, 15 to 16. Brian Smith’s rink started well but lost by 17 shots, 9 to 26. Markham’s rink was behind early, made up some ground, but lost by eight shots, 17 to 25. Richard Cookson’s rink recorded a seven-shot win, 23 to 16, to be the only shining light for the day. 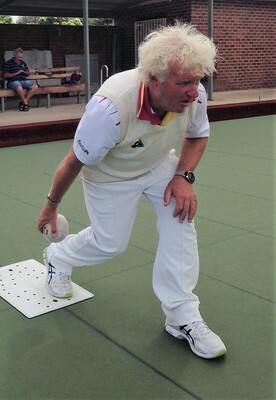 Monbulk 2 travelled to the Dandenong Club to play on grass where again the wind made conditions tricky. Furby’s rink started slowly but then really got into gear, picking up a number of multiples to win by 25 shots, 39 to 14. Francis’ rink picked up a six on the second end and never looked back, winning by 13 shots, 25 to 12. Grame Gollers’ rink had a 15-shot lead after the ninth end, but this was reduced to just three shots with three ends to play. The team steadied and ran out winners by four shots, 20 to 16. Case Broekhofs’ rink had the only stumble for the day, losing by 12 shots, 13 to 25. The side had an overall win by 30 shots, 97 to 67, which places it in second place on the ladder. Monbulk 3 played Eastwood Golf at home and had a very close tussle. Petr Hiscox rink was able to get over the line, winning by five shots, 18 to 13. However, Doug Elliots’ rink struggled early and was not able to make up the deficit, losing by seven shots, 15 to 22. This meant the side lost by two shots, 33 to 35.